The #6 Sycamore bus travels between Waterfront Village south of Downtown Buffalo and Walden Galleria in suburban Cheektowaga. Walden Galleria is an important economic engine for the Niagara region, attracting thousands of Canadian shoppers to the Buffalo area every week. The #6 Sycamore bus is a vital link between Buffalo and Walden for shoppers and employees, being one of only two bus routes (alongside the #32 Amherst) that provides a one seat ride to this major commercial center. Unfortunately this level of service has become increasingly dismal in my opinion. The end of the summer season provided some relief from crowds on the NFTA buses, especially during weekends. Now that winter is almost in full swing the crowding situation on the #6 bus has returned, reaching a point where for the first time in four months I was left behind at a stop because there was no more space. The Sycamore bus only runs every 30 minutes during non-peak hours, a woefully low level of service considering that it serves one of the largest retail employment centers in the entire metropolitan area, and employees there are more likely to use public transportation to get to work especially considering the demographics along the route. The fact that the bus that left me behind was the bus before the bus that I would need to catch without being late to work only added to the insult, making my prudence moot. The Sycamore bus is frequently crowded outside of the traditional weekday rush hour period. The bus runs that I frequently use are between noon and one PM, and the buses are frequently standing room only as they leave downtown. Weekend buses are worse as the headways can grow to over one hour. A recent Saturday trip saw standing room only and frequent delays during the boarding of passengers. Even worse, the crowding situation was only relieved well into the run when the bus had already completed around 75% of the route between Walden and Downtown Buffalo. In the end the bus run almost 12 minutes behind schedule by the time it reached downtown Buffalo, which is over 30% of the estimated run time. America is a country that is heavily dependent on car ownership, with 86 percent of commuters using a car to get to work in 2009 . 76% of commuters drove alone during their commute—that equals over 105 million people. Public transit ridership is therefore a relatively small component of the transportation system in this country but the people who tend to use it are very dependent on it. Cutting public transportation is a very incendiary issue as a result, due to the racial makeup of public transit riders. Blacks have the largest percentage of commuters (11.5%) using public transportation than any other ethnic group; cuts are likely to affect them dispraportiaonately especially in Detroit. 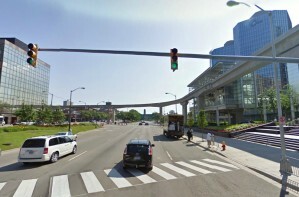 The racial makeup of Detroit is almost 83% Black  with high levels of poverty and functional illiteracy ; obtaining the opportunity to operate a car not only involves financial obstacles for a large portion of the public but learning difficulties as well for some drivers when it comes to driver education. If workers in these situations are going to find and maintain employment then public transportation must be adequately funded. Public transit riders already face some of the longest commutes in the country; despite the frequent stories concerning gridlock on expressways the average commute time nationwide in 2009 was only 25 minutes. The New York City metropolitan area has the longest average commute time of 34.6 minutes; coincidentally, it also has the highest rate of public transportation usage, about 19%. Over 50% of commuters in New York City proper get to work using public transportation. Cutting public transportation funding means two things: fewer routes and less frequent service. Fewer buses per hour means that public transit riders in Detroit can expect to wait even longer for buses which will likely force many to leave earlier to reach their job, thereby taking them away from the home for longer periods. This has negative implications when it comes to issues like childcare. Longer commutes and more time away from home will likely lead to decreased morale among commuters and increased domestic problems as well. Another problem is that commuters who miss buses will face longer wait times in very adverse conditions; Detroit's location in the Upper Midwest means plenty of cold and snow in the winter. Fewer routes means some riders will have to travel farther to reach a bus stop. This would place additional hardship on the elderly who due to fixed incomes or physical inability to drive rely heavily on para-transit and buses. One solution would be to abandon traditional routes using major thoroughfares and instead adopt ones that go into neighborhoods and pick up passengers. People would ride the bus longer but have a shorter walk to the bus stop. Such an approach would require a detailed analysis of where transit riders live and detailed bus stop usage statistics. Detailed bus stop usage analysis could also be used to eliminate stops that are significantly underutilized thereby allowing the bus to travel faster. Faster commute times could allow people to reach work in time even if they miss their preferred early bus. There has been much talk by politicians during this election cycle about people who don't want to work or are lazy. The fact of the matter is that many people in cities like Detroit face tremendous hardship in reaching their places of employment; some workers have probably lost jobs because of attendance problems caused by long commutes dependent on multiple transfers. One worker in Detroit spoke about losing an hour of work because of cutbacks in schedules ; people in these situations are at a disadvantage in the workforce compared to commuters without such restrictions. If governments want to promote economic growth then action must be taken to help people in these situations. If a worker has to catch a particular bus in order to pick up their children, then after school and daycare programs need to be expanded so that people do not have to leave work earlier than they would like. 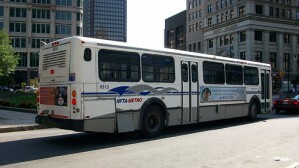 Unfortunately since public transportation is being cut in Detroit other public programs are likely facing similar cuts. Cutbacks in urban transportation systems like Detroit's are not the right method to ensure fiscal health. People are going to have a harder time getting to work, and some might even lose their jobs because of these cutbacks. Businesses having to close down due to decreased patronage is another possibility. If governments are serious about getting people back to work then public transportation funding needs to be increased instead of cut, and the transportation costs for all Americans need to go down. The best way to do that is for people to abandon driving to work alone and carpool, or better yet, take public transit. We can only hope such a change happens sooner rather than later. © 2006-2019 Jeremy Moore. All images are copyrighted by their respective authors.